These books will be ordered in once we receive your order, please allow 3-5 working days to source. Please choose OP3 at check out. 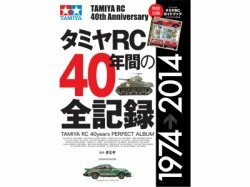 Special Tamiya RC Album released from Tamiya!! Over 1000 RC cars in the book, include RC Cars, RC Tank, RC Track, RC Glider, RC Yacht and more! Whooping 336Page. Please note, books are in Japanese. Must have item for Tamiya Freaks!! Simply enter your details below and we will send you an e-mail when “63488 Tamiya RC 40th Anniversay 40 years Perfect Album” is back in stock!